The Trobairitz or women troubadours were the first known and named composers of Western secular music. Check out this YouTube page for many videos with Trobairitz music. 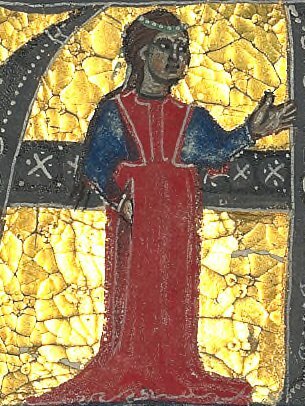 Castelloza, one of the most famous of the women troubadours or Trobairitz. More about the image. [iMeg Bogin, ed. and trans. The Women Troubadours (NY: W. W. Norton & Company, 1980), 133.